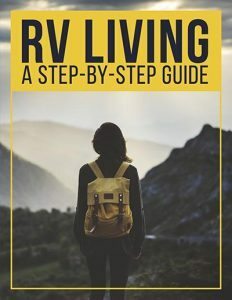 RV’s have come a long way to evolve into today’s luxury homes on wheels, complete with master bedroom and Jacuzzi but it all began with the invention of the car and die hard campers. Car lovers and nature lovers joined together in 1910 to create customized cars with lockers and bunks and inventive water holding tanks. 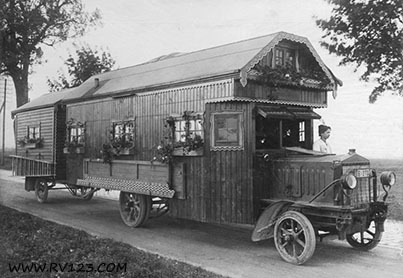 During the 1920’s as the roads started to improve RV enthusiasm started to grow. 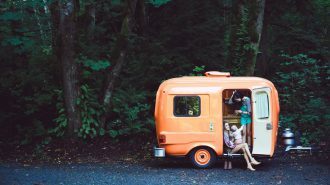 In the 1930’s, RV ownership grew steadily. 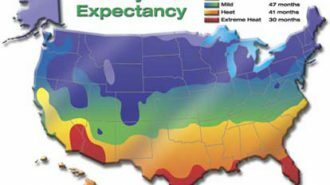 Even the great depression did not stop this growth. After the second world war trailer manufacturers began to build motorized versions of their trailers. 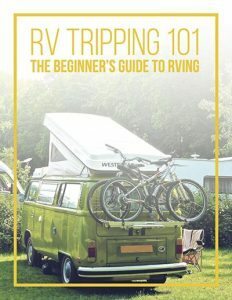 Rving truly become a thing in the 1950’s when class A motor homes started to be created. Slide in pickup trailers also became popular during this period. 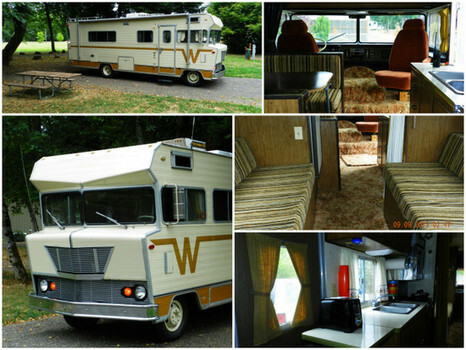 The 60s and 70s were not too great for the RV but interest doubled again in the 80’s. 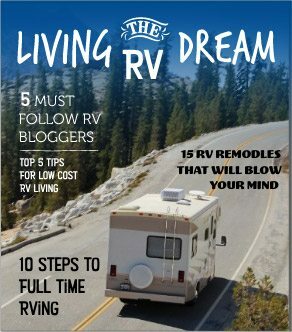 Below is a complete walkthrough of RV history. 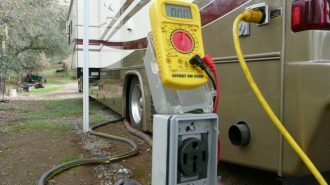 In more recent years, RV’s have gone beyond what most imagined as technology and interest continue to grow, the RV will without a doubt be a staple in most homes. An edition of Motor Magazine dated 1909 shows a car pulling a trailer. Cars had beds, small kitchens, hot and cold running water. 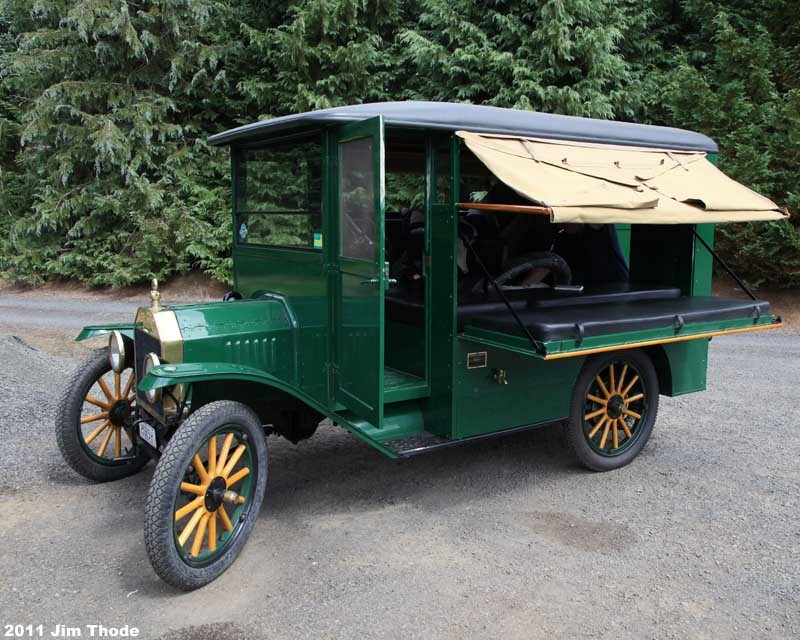 Before long, simple wooden structures were constructed on the chassis of a car and the first motor homes were made. 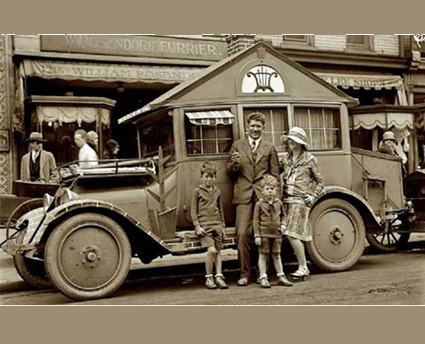 In 1910, the very first motor home ever made was built from a 3 ton Packard truck. It could sleep 11 people and was 28 feet long and had an icebox, toilet, salon and was 6 and a half feet wide. The motor home was used up to 1924. Campers continued to find more ingenious ways to adapt cars to their lifestyles. Wood and tents were mostly used. 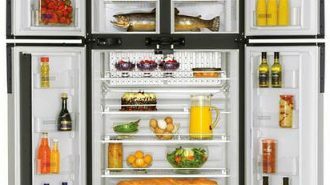 These RV’s and motor homes had refrigerators, kitchenettes, showers or baths and other typical features. Some were even hooked up with telegraphs and electric lights. 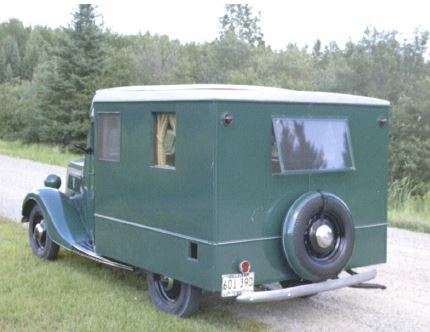 The house car “gypsy van” was built in 1915. It weighed 8 tons and had an interior like an English manor house. 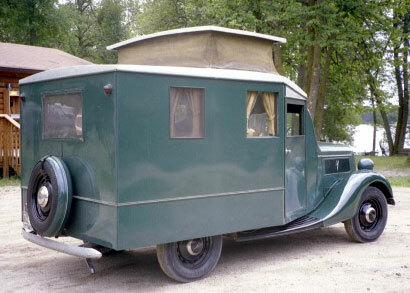 In 1917, the first fifth wheel camping trailer was invented. Up to the 20’s the most common car was the Ford model and RV’s were custom built. The nomad house car was built from 1923 on the chassis of the Ford Model TT. 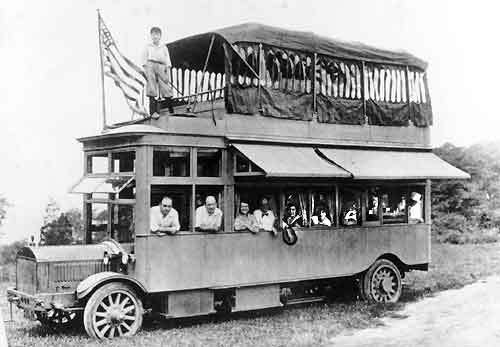 In 1927, Leonard S Whittier built a custom RV on the chassis of a Brockway model” H’ bus chassis. It had wicker chairs, bookcases, a refrigerator and sink as well as electric stove. It even had a septic tank. 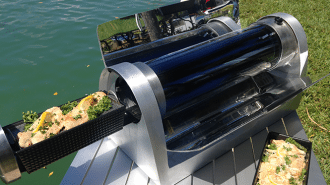 This decade saw manufacturers begin to make travel trailers. The smallest were tiny and the largest were huge. 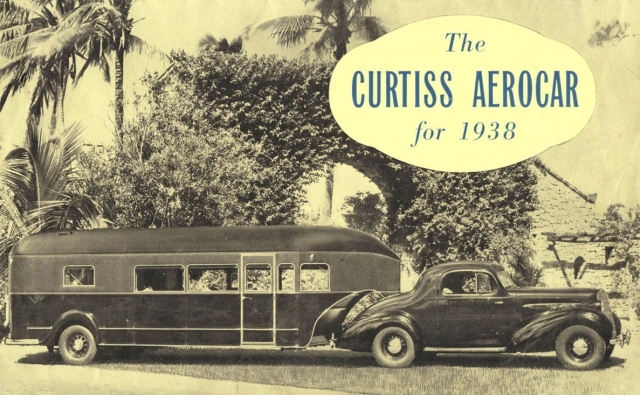 In 1936, the Curtis Aerocar was made by Glen Curtis an aircraft designer. In the same year the clipper, manufactured by the Airstream Trailer Co with its riveted aluminum, resembling an airplane could sleep four and carried a supply of water. 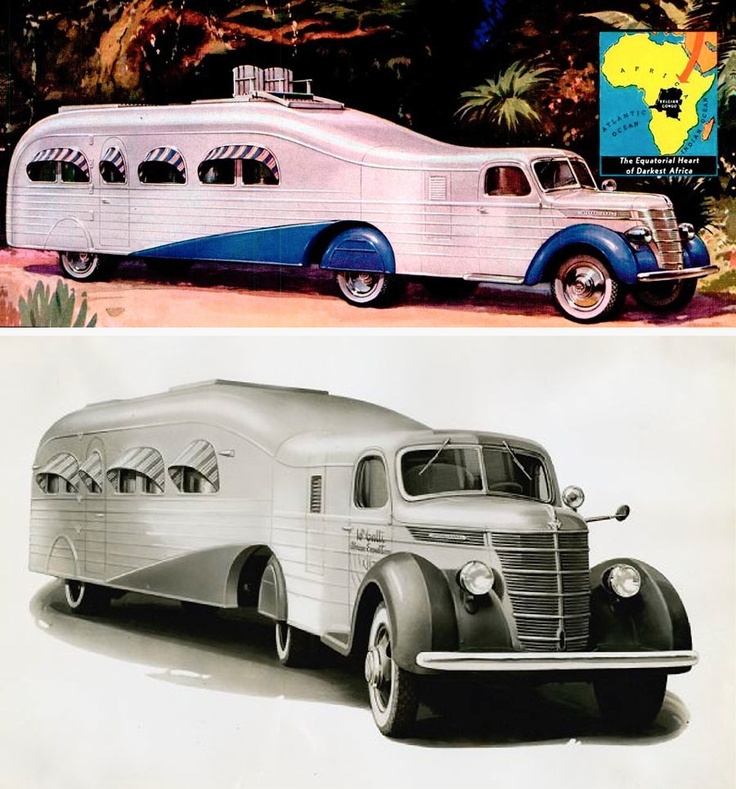 In 1937, the teardrop became popular and could sleep two and in 1938 Gatti and Italian Author had two “jungle yachts” made for his trips to Africa. 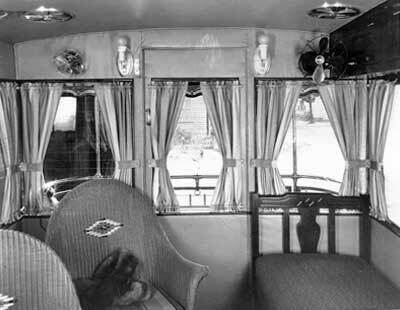 The jungle yachts had a dining car, bar, two bedrooms and lighting as well as a telephone. 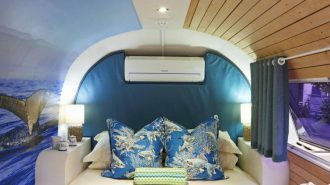 The same company built a 50ft 5th wheel that was a semi-trailer and included an observation deck, wine cellar and all the latest conveniences. It was sold to an Indian Maharaja. 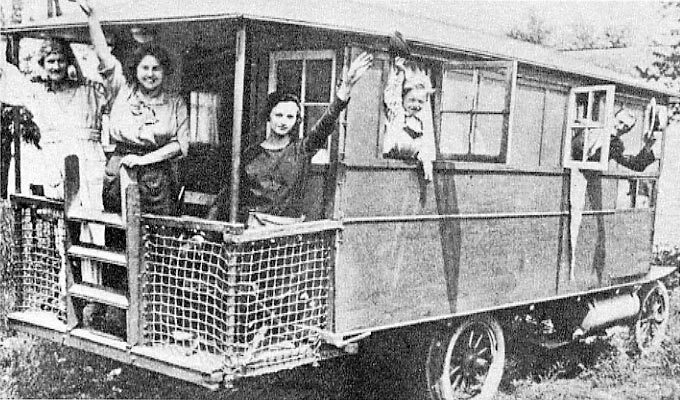 During World War II, RV growth halted as trailers were needed for other uses. After the war was over, manufacturers again began to create innovative house cars that changed the future of RVing almost instantly. Howard Hughes the legendary movie producer had 8 RV’s built that served as mobile dressing rooms. 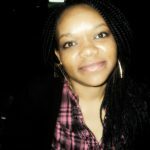 They had mahogany interiors, bathrooms, a refrigerator, stove and air conditioners. In 1942, the US military purchased thousands of the “Palace Expando” a revolutionary trailer that had a shower and bath and expanded on both sides. Newly enlisted men and their families were housed in these trailers. 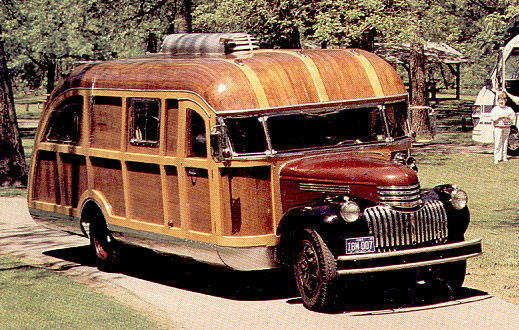 In 1946, a fascinating motor home was built on the chassis of a Chevrolet. According to historic resources, the owner of the RV couldn’t go on vacation without being stopped by curious people. 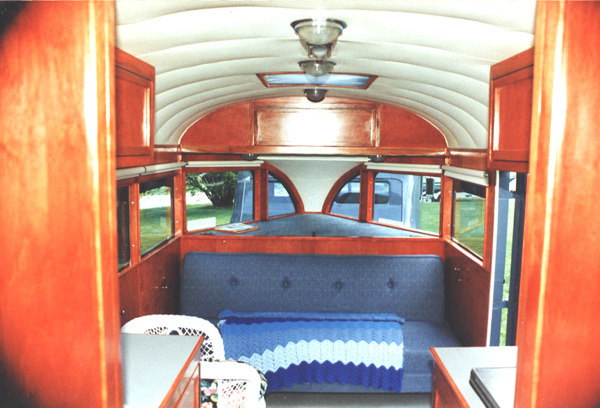 The Shore land Tandem Town and Country was a 30 foot long trailer with electric fixtures and 3 rooms. In 1948, Flxible Bus Company began manufacturing custom coaches. RV’s expanded in size and length with luxury interior décor and modern conveniences such as plumbing and bathrooms as well as kitchens. 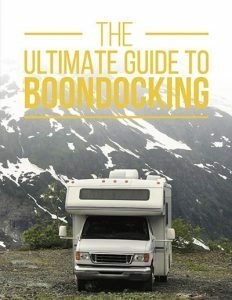 The 50’s were the decade of bloom for the RV and by the end of the decade, mobile homes and travel trailers were ingrained in the camper lifestyle. Terraced, upstairs, downstairs models with separate private bedrooms were not uncommon in response to the interest created. The executive flagship built in 1952 was 65 feet long and weighed 18 tons. It had 10 wheels and was equipped with two bathrooms, wall to wall carpeting and a 21 inch TV. It had a portable pool and diving board. It retailed at $75,000. An ingenious 2 story design made in 1955 and had two upstairs bedrooms, a Master bedroom downstairs and other conveniences found in modern RV’s. It could sleep 8 people. 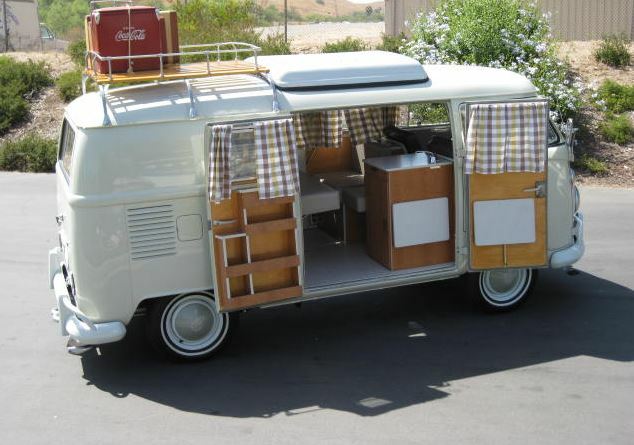 In 1958, the first pop up truck camper was made and five years later, production began of this unit. 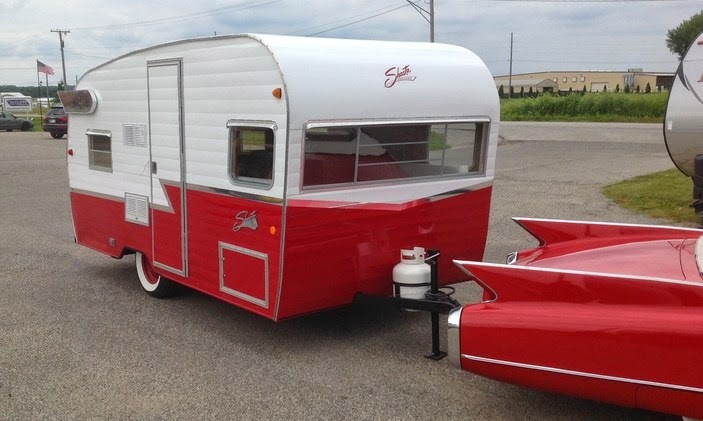 1959 saw the entrance of Shasta in the RV industry and soon became the most popular travel trailer of the era. This early RV was manufactured by Anheuser-Busch. They were mounted on the Chassis of a Model Ford T and could be yours for the low price of $535. The camper was designed by Samuel B. Arthur. 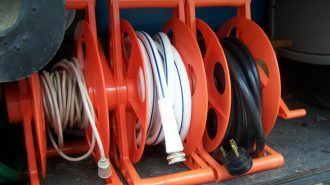 It was sold in a completely knocked down kit that could be shipped anywhere in the country. It was forest green and a number of them are still available today. It had two wide comfortable beds courtesy of pull outs on either side. Four people can sleep in the two beds. 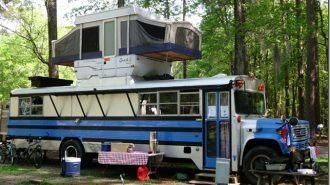 This custom RV was built long before RV’s were a way of life. 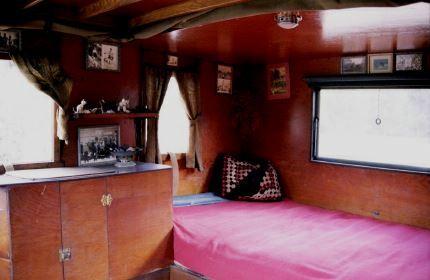 It is believed the RV had a woodwork interior though none of the pictures in existence show this. The car was 7 feet wide and 9 feet high making it practical. 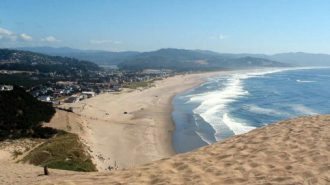 It extended over 30 feet from bumper to observation platform and had electric heaters, a refrigerator and oven and stove. The master bedroom had two wicker chairs and cupboards. Gray green leather featured on the upholstery and a complete bathroom finished in cream tile emptied into a septic tank on the floor of the RV. The driver and passenger seat modified into single beds and a rear observation platform at the back of the vehicle afforded comfort with a view. Built in Detroit the Aerocar was commercially manufactured. They were designed by Glenn Curtis an aircraft designer using plane principles. The trailers had no chassis and the wheels were placed at the very end of the curved roadster. The Trailer retailed at $5000. The tow car was custom built for the trailer. It was chauffeur driven and had pull down windows and the rear seat converted into a bed making it self contained without the trailer. 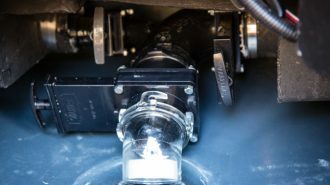 Storage compartments and an intercom system connecting the car and trailer are also featured in the car. Produced in limited numbers the Ford House car had steel cladding and wood paneling. Only six of these were made every year. The interior was lined with wood and the door frames were thick solid wood. 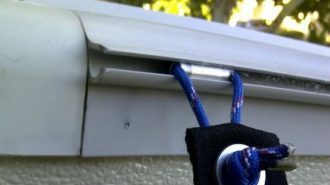 A storage cabinet is under the bed and curtains and pull down shades feature on all the windows. Attilio Gatti made 10 expeditions to Africa using these “jungle yachts”. Flxible is now known as Custom Coach Corp. It was founded in 1913 and made the Flxible side cars for motorcycles. Flexible soon removed the E and became Flxible gaining distinction for its unique sidecars. Ford then made the Ford Roadster and sold it at $360 making the side car and motorcycle obsolete. 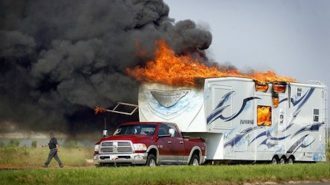 Flxible then turned to the RV market. In 1936, Flexible concentrated on coach conversions and introduced its clipper range of buses. 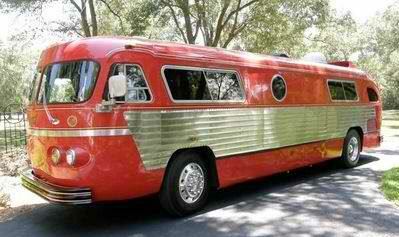 In 1955, Flxible started converting its buses into luxury motor homes. 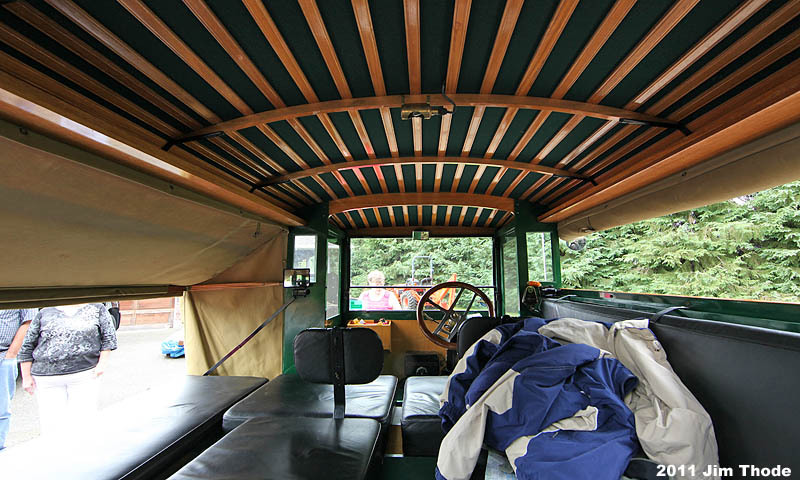 The interior of these coaches features wood grain plastic drawers and cupboards . 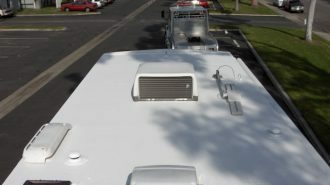 Coaches with a triangular mesh on the rear rift side of the vehicle have air conditioning. These motor homes were a popular RV built on a Dodge Chassis. 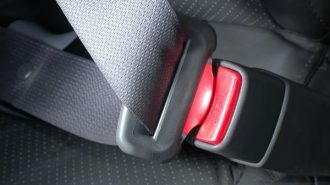 When Dodge stopped manufacturing the Chassis, Travco went under. 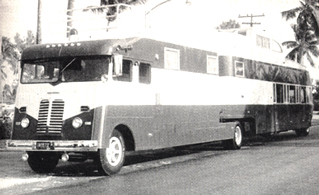 The Travco motor home was built on a Dodge Chassis. It sold for $9000 and enjoyed the bulk of the budding motor home market. 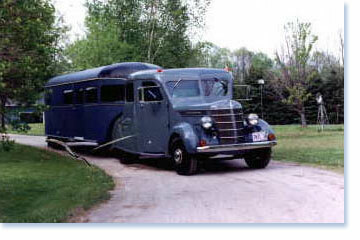 Dodge motor home was revolutionary in shape and construct utilizing fiberglass and eliminating dry rot. They had fully equipped kitchens and the interiors were well made and practical. 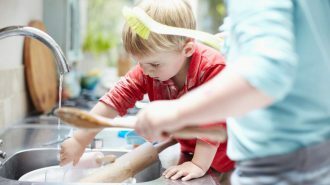 A dinette, refrigerator, double sink, floor coverings and large closets are featured in these cars. Founded in 1958, Winnebago began as a company designing furniture for travel trailers. The first Winnebago was made in 1966 and was sold at half the price of competing models. The name soon became synonymous with motor homes. Volkswagen was already entrenched in America by the 60’s. The Westfalia camper by VW was manufactured in 1967. 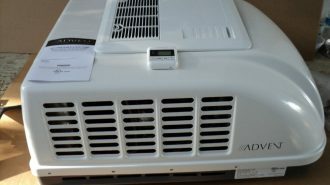 Around 100 of these conversions with electrical hook ups and an ice box, curtains and optional popup tent were purchased in Germany and brought to the states. Even before roads and flushing toilets, travelers placed their supplies on whatever they could find and headed out into the wild. Many contraptions existed but it wasn’t until 1959 when the term Motor home was applied. 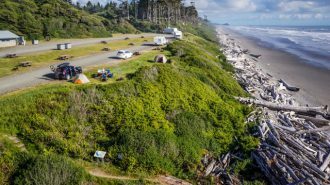 Most features in today’s Rv ‘s were conceived by the early RV pioneers and by the 80’s RV included entertainment centers, saunas and Jacuzzi s. The RV lifestyle has been ingrained in American history for decades. What do you think of these vintage cars? Tell us by commenting below!